Despite the fact that my flight was boarding, I was at the next gate over, talking to Alisonna. "Have you ever heard of ʻaumākua? It's a family guardian. Hawaiians believe in family guardians ... there's multiples, like geckos, sharks, turtles ... Gecko is mine, and so I decided to put it on my foot, on me left side, actually because in Hawaiian culture, your left side is your man side and your right side is your woman side ... the two orchids are for my ... parents, and this right here, the lauhala [the curved fragment above the two orchids] is for the family." She credited the work to an artist called "Nae" who had worked at 808 Tattoo Studio in Kāneʻohe, Hawai'i. A warm mahalo to Alisonna for sharing her guardian tattoo with us here on Tattoosday! 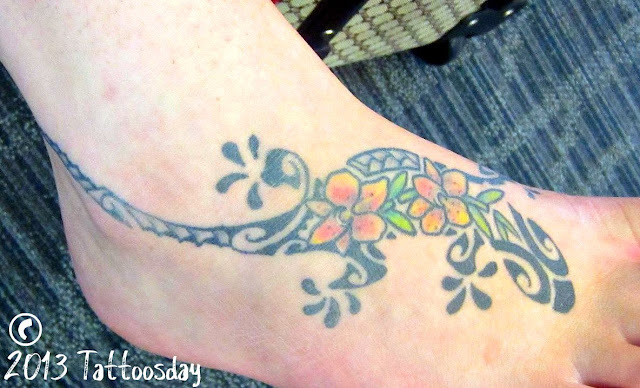 Posted in 808 Tattoo Studio, gecko, Hawai'i, Hawaiian, lauhala, Orchids, Tattoosday Goes to L.A.